Saturday Vigil Mass is 4:30 p.m.
Holy Days of Obligation are always different times – Please check the parish bulletin and our Parish Social Media for accurate times. Help us to worship God in a beautiful way by becoming one of our many volunteers who make the weekend Masses a great gift. Readers, Greeters, Ushers, Eucharistic Ministers, Altar Servers, Singers, Musicians, Church Decorators, Church Cleaners all volunteer their time and talent to make this parish shine on the weekends. Be a part of something great… volunteer today. Masses may be offered for the intention of specific persons, living or dead. Traditionally, a Mass card is given as a way to inform the loved ones of a deceased person that Mass will be celebrated for the happy repose of the soul of the departed. Arrangements may be made in the Rectory office. Call us today or Email us below. Holy Communion is administered regularly in the home to aged and infirm persons who cannot come to Mass. 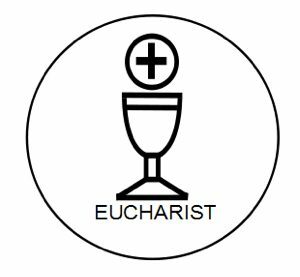 Communion is brought monthly by the parish priests and deacons, and weekly by lay persons who serve as Extraordinary Ministers of Holy Communion. Please make arrangements for Communion in the home by contacting the parish office. Parish ministers will be happy to take Holy Communion to persons who are in area hospitals and nursing homes upon request. Catholic facilities operated by the archdiocese or by religious communities usually have a full-time chaplain to administer the sacraments. Because of the HIPPA Law we do not know when someone in the parish is in the hospital unless they or their loved ones inform us. We will be happy to visit someone if we know the exact hospital and room number. First Holy Communion is given each Spring to students in our parish school and in our parish Religious Education Program (P.R.E.P.). Students enrolled in private Catholic schools should contact the Director of Religious Education to make arrangements for First Communion. Baptized teens and adults who have never been received Holy Communion are prepared for reception of this sacrament by the RCIA program.